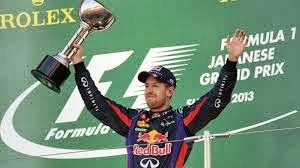 Sebastian Vettel triumphs yet again in a race where his driving was anything but perfect. Sebastian Vettel acknowledges the crowd and surely his 4th straight World Championship. The Suzuka circuit evokes special memories. Many of the sport's greatest drivers have been crowned here. The only classic figure of eight circuit on the calendar and with it`s narrow track has made for some great races in the past. Was a certain young German driver going to be crowned champion today? Was this going to be a classic race to match previous outings here? ummm... not quite. This was a rag-tag race by the 3 time World Champion and not anywhere near the levels of perfection reached in recent races. He frequently rode kerbs, locked up at corner entries, and at one point actually forgot to deploy DRS whilst trying to overtake! Football fans know that if you can still win when you aren't playing well then championships are right around the corner! In Vettel's case surely that corner will be India, in two weeks time. At the start Lewis Hamilton 3rd on the grid lined up at an angle obviously looking to drive between the two Red Bulls of Webber and Vettel on the front row. 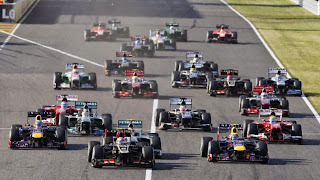 As the lights went out Romain Grosjean got away with most traction and took a surprise lead from all of them. Lewis did indeed manage to split the Bulls but only for his rear tyre to kiss Vettel's car and he suffered a puncture that would lead to his retirement. Was able to give chase to Grosjean, but in doing so wore out his shoes a little too soon and had to pit early. In doing so he switched from a 2 stop strategy to a 3 stopper. Vettel on the other hand was able to stay out later and was able to do the faster 2 stop. This was to prove the deciding factor between the two Bulls despite a late onslaught by Webber who failed to pass the very fast Grosjean early enough to challenge Vettel in the closing laps. Vettel's only other title challenger Fernando Alonso could only manage 4th, some 45 seconds behind Sebastian. 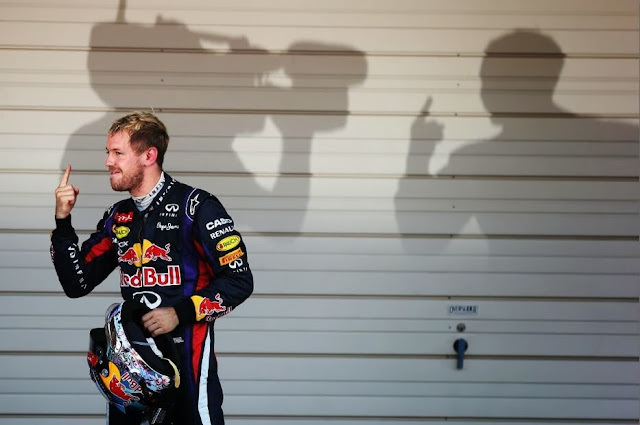 Hard for Sebastian Vettel to lose this championship from here? Surely India will become a world championship crowning venue - we will see. Please remember, no booing! The Suzuka circuit evokes special memories. Many of the sport`s greatest drivers have been crowned here. The only classic figure of eight circuit on the calendar and with it`s narrow track has made for some great races in the past. Was a certain young German driver going to be crowned champion today? Was this going to be a classic race to match previous outings here?... - Erm.. Not quite! This was a rag tag race by the 3 time world champion and not anywhere near the levels of perfection reached in recent races. He frequently rode kerbs, locked up at corner entries, and at one point actually forgot to deploy DRS whilst trying to overtake! Football fans know that if you can still win when you aren`t playing well then championships are right around the corner! In Vettel`s case surely that corner will be India, in two weeks time!